Editor’s Note: Sunanda Gandhi’s birthday was today, 1932. For over twenty-five years, Sunanda engaged in extensive, productive and compassionate work with orphaned children, prisoners and victims of domestic violence as a marriage counselor for Bapnu Ghar, an organization for destitute and abused women. 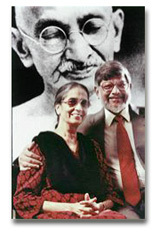 The couple together wrote The Forgotten Woman, the only biography of Kasturba Gandhi, wife of Mahatma Gandhi. Sunanda also served as senior researcher at the MK Gandhi Institute, which together with her husband Arun, she founded at Christian Brothers University in 1991 in Memphis. I first met Arun and Sunanda in Memphis, Tennessee at Christian Brothers University where their peace institute was first established in 1991. They were introduced to me by a common friend, Dr. Donald Wagner, the founder of the Palestine Human Rights Campaign. I asked Sununda, a very calm and serene person, if she ever got angry. She said that the last time she showed anger was over 50 years prior to our conversation. She said that Arun was courting her in Bombay and they got on a small bus together. There was no room for them to sit together and she had to sit between two men across from Arun. Apparently, these two men had had a bit to drink and got fresh with Sununda. They started to tease her and say inappropriate things to her. She said that she looked to Arun to defend her honor and he sat there and said nothing. After they left the bus, she angrily told Arun that he should have defended her honor against these two men. She felt that, as her suitor, he had a responsibility to do so. She said that he then asked her if they touched her or physically hurt her and she said no.He then told her that she also had to learn to vent her potential negative emotions and thoughts into positive ones. That was the last time that Sununda was ever to vent anger.